In mid April Nick and me got to visit the Byron restaurant in Beak Street for the launch of their new menu – the first menu change for Byron since they first opened in 2007! And it’s got all the veggie goodness added to it! For the addition to their menu Byron have decided to add more versatile options to the restaurant – in contrast to what has been their mission until now: to provide traditional ‘proper (meat) burgers’. 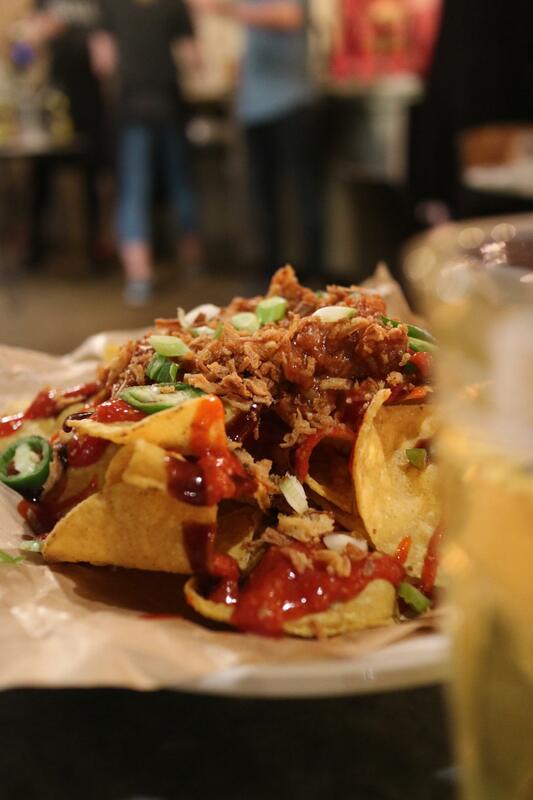 Isn’t it great to see that a meaty restaurant like them sees the need to add vegan options? 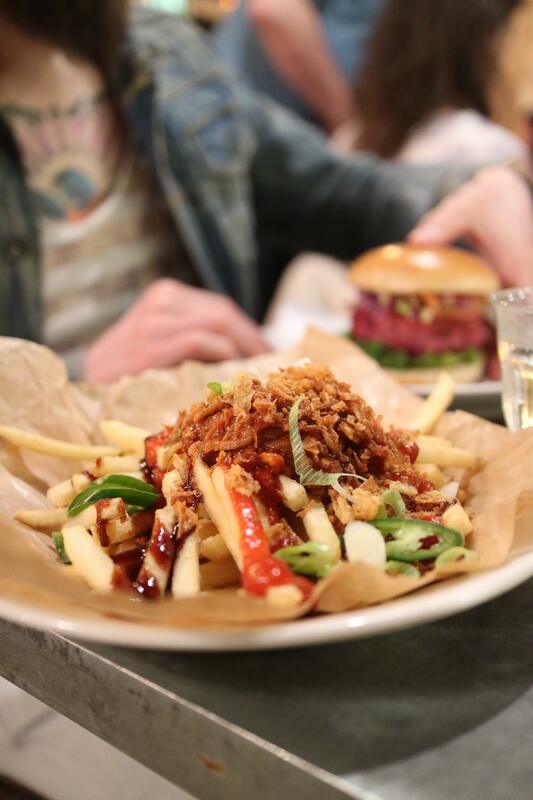 I remember I first stepped into a Byron years ago – in Camden – with a couple of non-vegan friends, just to find that they didn’t have a single item for me to enjoy on the menu. So glad these times are over now and I can still eat there when my non-vegan mates want to go! As the starter we had the loaded Nachos which are the vegan starter option. Loaded with pulled jackfruit that is seasoned beautifully! Very much reminded Nick and me of Pulled Oumph which we both love also. The nachos also had a good kick with their chilli sauce on top – which meant that I as a chilli-intolerant self had to be careful and pace myself whilst Nick could fully dig in. Onto the mains! 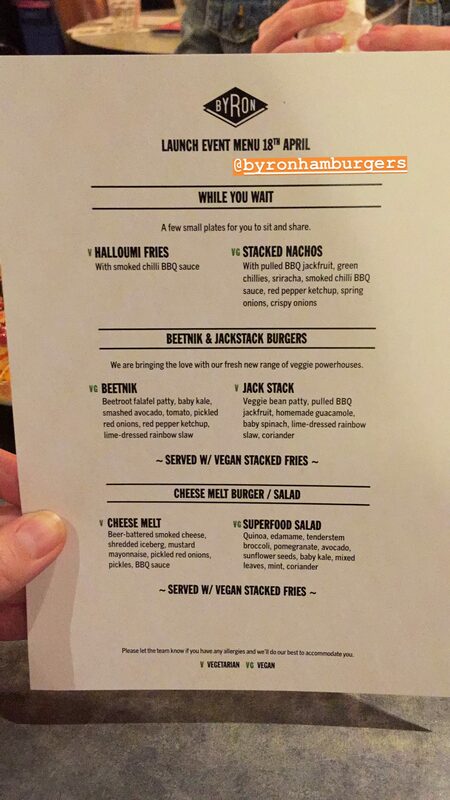 We already saw posters of the so called ‘Beetnik’ – their new vegan addition to the burger menu – as soon as we entered the restaurant for the new menu. 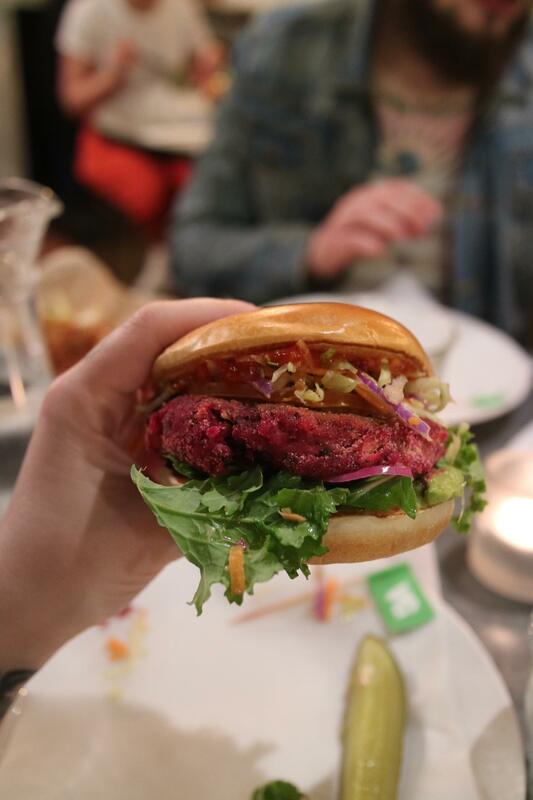 And it looked great, however I have to admit that I was sceptical as I am not a huge fan of beetroot burgers – mainly because they often taste too sweet for my taste. But let me tell you: when this one arrived my tastebuds couldn’t believe the feast they were getting! 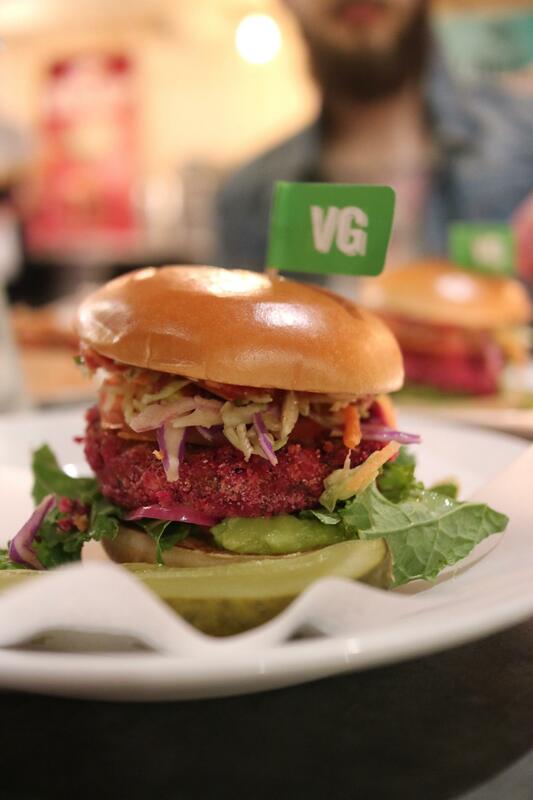 The patty is very well seasoned – with the perfect mix of sweet (from the beetroot) and salty, a heavenly combination! The patty was also very well created and didn’t crumble apart like some vegan burgers tend to. Both Nick and me were positively surprised with this burger! Oh and might I tell you that it’s also gluten free when ordering with their gf buns? I might have to add as well that we both did not know how much food to expect from the launch event – from experience these events can be hold very differently and I’ve seen everything from going home hungry over little tasters and a full sit down menu. So we came prepared with some space in our tummies but also both had a good lunch – and then were wow’d to find out we were having a full on menu! 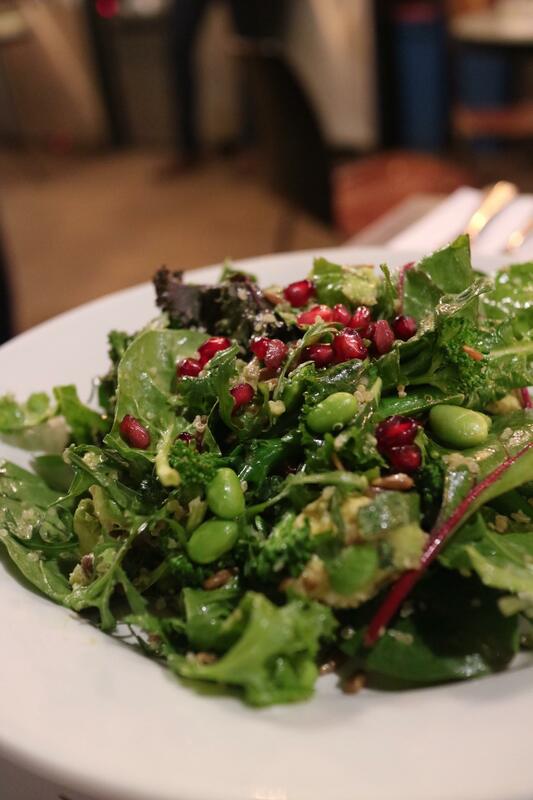 After the burger we got to try their superfood sald and at this point I was already stuffed – but simply had to try it as there was avocado all over it! This one was a total game changer though – woth crunchy quinoa, chewy tenderstem broccoli, the perfectly smooth avocado, sweetness from pomegranate… it was simply the perfect combination of different flavours and textures which made it super exciting to try! Oh and you totaly should have seen my stuffed face when also loaded fries arrived on the table at the end… as someone who doesn’t like to waste food I stuffed myself so much that I was feeling full for days (no, not kidding here!) and rolled home more than satisfied. 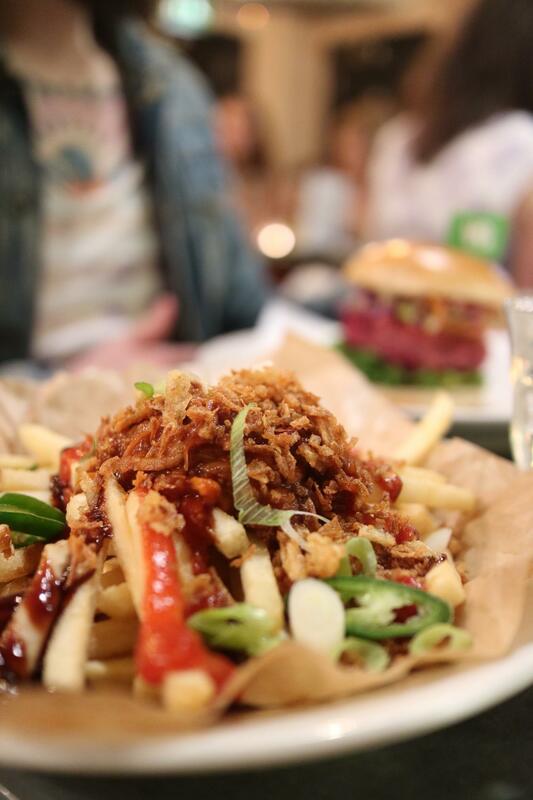 Find out more about Byron’s new menu here.